In the United States, 20 million women and 10 million men suffer from a clinically significant eating disorder at some time in their life, including anorexia nervosa, bulimia nervosa, binge eating disorder, or EDNOS (eating disorders not otherwise specified). EDNOS, formerly called atypical eating disorder, refers to behavior or eating patterns that are characteristic of some or all eating disorders, including anorexia nervosa, bulimia nervosa, binge eating disorder and compulsive overeating. The most well-known eating disorders are probably anorexia nervosa and bulimia nervosa (often called “anorexia” and “bulimia” respectively). However, there are other food-related disorders, like avoidant/restrictive food intake disorder, body image disorders and food phobias. The most common eating disorder in the United States is binge eating disorder (BED). It is a severe, life-threatening disorder characterized by 1) recurrent episodes of eating large quantities of food (typically very quickly and with the result of discomfort); 2) feeling of a loss of control during the binge; and 3) experiencing shame, distress or guilt afterwards. The binge eating occurs, on average, at least once a week for 3 months. The binge eating is not associated with the recurrent use of inappropriate compensatory behaviors (e.g., purging) as in bulimia nervosa and does not occur exclusively during the course of bulimia nervosa or anorexia nervosa. BED usually begins in the late teens or early 20s, although onset can occur in young children and older adults. Approximately 40 percent of individuals with BED are male. 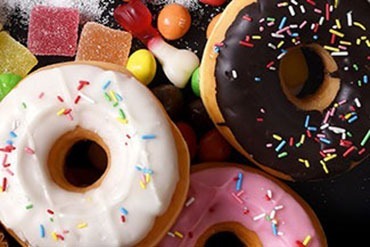 Research into the association between BED and food addiction has recently received greater attention, in part due to the similarities between BED and the behavioral indicators of addiction, such increased compulsivity, diminished control over consumption, and continued excessive consumption despite negative consequences. Hudson JI, Hiripi E, Pope HG Jr, and Kessler RC. (2007). The prevalence and correlates of eating disorders in the National Comorbidity Survey Replication. Biological Psychiatry, 61(3):348-58. Wade, T. D., Keski-Rahkonen A., & Hudson J. (2011).Epidemiology of eating disorders. In M. Tsuang and M. Tohen (Eds. ), Textbook inPsychiatric Epidemiology (3rd ed.) (pp. 343-360). New York: Wiley. Westerberg, D. P., & Waitz, M. (2013). Binge-eating disorder. Osteopathic Family Physician, 5(6), 230-233.